A returning spacecraft may someday hurtle through Earth'satmosphere bearing evidence of life from Mars. But scientists won't casuallycrack open the precious payload in any old laboratory. They will need aspecially-designed building that not only protects the Martian samples fromterrestrial contamination, but also prevents any Martian material or organismsfrom escaping into Earth's biosphere. Such a Marssample return mission could signal a huge scientific coup for understandingthe red planet's ability to harbor life, and so NASA launched the initialphases of a sample return mission in the late 1990s. Programmaticconsiderations, including technical and budgetary concerns, killed the missionplanning early on, but the U.S. space agency continued to study what type ofsample return facility (SRF) might become necessary for such a mission. Now NASA's Mars team has released the results of that study.Three architectural firms drew up plans for how humans and robots could handle extraterrestrialsamples within special facilities. "We could build a facility today that would meetrelevant standards for biocontainment (to protect the environment) and we couldbuild a facility today that would meet scientific needs for contamination control(to protect the samples)," said Deborah Bass, a scientist with NASA's MarsExploration Program. "Our technological challenges arise from the need todo both at the same time!" Bass collaborated on the analysis of the facility designswith Karen Buxbaum, NASA's planetary protection manager for the Mars Program,and other NASA colleagues and planners. Their assessment of the three designsubmissions was detailed in October's issue of the journal Astrobiology. A Mars sample return mission won't mark the first time thatspacefarers have brought back extraterrestrial samples. Apollo astronauts whowalked on the lunar surface returned with hundreds of pounds of moon rocks,and NASA built the Lunar Receiving Laboratory to quarantine the lot. But Bass and Buxbaum point out several differences betweenthat case and a future Mars sample return mission. A Mars mission would returnjust over 1 pound (0.5 kg) of samples, as opposed to the hundreds of pounds oflunar regolith, and so any future facility's tests must use as little of theprecious Martian samples as possible. A Mars SRF would also require much less space than the LunarReceiving Laboratory, because there won't be any returning astronautsfrom Mars who require quarantine. Requirements linked to scientific understanding havesimilarly changed since the first Moon landing. NASA initially tried plantgrowth experiments in the lunar regolith samples, but no scientist today wouldbother with similar Martian soil experiments because of the lack of viabilityfor plants. And that's assuming there would be enough soil in the Martiansample to conduct such tests. Researchers also first assumed that animal testing wouldbecome necessary for biohazard experiments involving Mars samples. But advancesin biological analysis have opened up the possibility that scientists could runsmaller tests that don't require animals. Finally, scientists and policymakers want to take morecautionary steps to protect Earth against any possibility that Mars microbes orother contaminants could escape the lab. "We know more about remarkable abilities of terrestrialmicrobes to survive (sometimes thrive) in challenging environmentalconditions," Bass and Buxbaum noted. "Many more regulations andsafeguards are now in place that must be observed to ensure a successful samplereturn program." NASA hired three architectural design teams to design afacility with containment equivalent to the Biosafety Level 4 labs, whichtypically house samples of highly infectious diseases. One facility design by Industrial Design and Construction(IDC) featured a mostly human workforce. Another design by Lord, Aeck, Sargent(LAS) took the opposite approach by creating a fully robotic facility, based onthe idea that robots would help eliminate human error. A third design by Flad & Associates (FLAD) took a middleapproach by having humans assisted by robots. 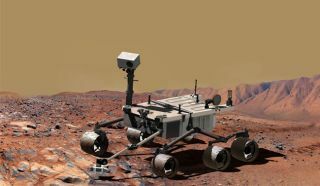 Robot advocates consider humans the "weak link" inthe chain, and argue that human operators also represent a big source ofpossible contamination for the Mars samples. But other researchers counter thathuman operators would add a special interactive and adaptive touch that currentrobots lack. Several of the facility designs also call for double-walledbiosafety cabinets, which use air pressure to keep any contaminant leakscontained within the double-wall design. That future technology may help keepany hazardous Mars materials inside the cabinets, and also keep out unwantedEarth material that could contaminate scientific testing. Based on the three design proposals, NASA planners and researcherssaid that a sample return facility would likely require 20 to 30 permanentstaff members and cost $121 million, not including an annual operational costof $7 million. NASA has again begun quietly discussing the possibility of afuture sample return mission. But such a venture would not represent astand-alone mission -- the U.S. space agency wants to work up to a samplereturn in several mission stages. "The first definitive step, which would be a rover tocollect and cache the samples, is under consideration for launch in 2018,"Bass and Buxbaum explained. Whether such a mission will get approved remainsuncertain, but people eager for a new glimpse of extraterrestrial soil couldsee their wishes fulfilled as early as the 2020s.